I got a ticket to Interesting Vancouver from Boris Mann, who uh reminded me that I owed him a recap in exchange. That’s a perfectly perfectly reasonable request, but that message didn’t sink in ahead of time, so I didn’t take notes or try very hard to remember. I’ll do a dump on my impressions, but you should note that I seemed to have been grumpy that evening, perhaps because I didn’t have enough dinner. James Sherret from AdHack: I was about 10 minutes late, so missed his talk completely. When I was younger, I wouldn’t have found anything at all wrong with that message. I would had little patience for old farts telling me (or anyone) that I should grow up and start being responsible blah blah blah. However, now that I am older and have seen how health issues can trash a life, I would suggest more caution, particularly for people who are citizens of countries without socialized medicine. Part of “being responsible” is saving away the money that you will need for later. When you lose your job. When you can’t work because of your illness. When your partner can’t work. When your mother has a heart attack. When your kid needs rehab. You might be fine now, but someday you won’t be. Running off to live in a third-world country probably increases your risk of illness, complications, accidents, and/or violence at least slightly. It also cuts you off from your family — the same family that you might need to turn to someday. Roy Yen, soomo.com: I think Roy was the one who was arguing that our “vertical architecture” (i.e. skyscrapers) was contributing to loneliness and isolation, and that we really needed a public gathering space in Vancouver. He said that Vancouver used to have a big public gathering space, but there was a riot in the 70s and The Powers That Be decided that having a big public gathering space was a Bad Idea, so redeveloped it away. He pointed out that the only public gathering space left is the back side of the Art Gallery, and that the Art Gallery is slated to move to False Creek. When he blamed the high-density development for loneliness and isolation, I was kind of stunned. “Has he ever lived in suburbia?? ?” I remember asking myself. I immediately thought of a neighbourhood in Orange County where a friend lived, where I spent a few days once. It was all snout houses, and my friend said that in a year of living there, she had never spoken to a neighbour. I think she maybe hadn’t even seen her immediate neighbours — they drove into their garage, and thence immediately into their house. I am now living in a skyscraper for the first time, and I find the density wonderful: I see people in the elevators, I see people as I walk to the bus stop, I see people as I walk to the grocery store, etc. etc. etc. It feels far more communal than driving to everywhere in a car by myself. I did think it was interesting to hear about the bygone public space and to think about the back of the Vancouver Art Gallery being the one public gathering space. However, most of the places that I’ve lived didn’t have public gathering spaces, and somehow we got by. James’ presentation didn’t have a real obvious thesis statement — I don’t know that I learned anything from his talk, but I remember I enjoyed it. He told the story of his evolution as a storyteller, and in doing so talked about the evolution of the Web. Cheryl Stephens, plainlanguage.com: Cheryl is a lawyer and literacy advocate who talked about how widespread the problem of literacy is. Later, she talked about how widespread illiteracy was, and said that only about 10% of the population could read at a college level. I didn’t know about Canada, but right around half of the US population has attended some college. Um, does that mean that 80% of people in college can’t read at a college level? I was a little confused as how explaining something verbally related to literacy. At the end, she rushed in about thirty seconds of how to make your prose more understandable. I personally would have preferred less talk aimed at convincing me literacy was a problem and more on how to address it. Irwin Oostindie, creativetechnology.org: Irwin talked about his community, the Downtown East Side, and in bringing pride to his community through culture, especially in community-generated media. I wanted to like Irwin’s lofty goals. He was a very compelling speaker. But I have done a lot of work in community media, and know that it is extremely difficult to make compelling media. It sure seemed like he was getting his hopes up awfully high. Well, best of luck to him. Maybe. He seemed to want to make DTES a vibrant, interesting, entertaining place. I worry that if it becomes entertaining, it will quickly gentrify. I think a lot of people in DTES don’t need entertainment, they need jobs. They need housing. Jeffrey Ellis, cloudscapecomics.com: Jeffrey gave a very quick talk advertising a group of comic artists who were about to release (just released?) another comic book. Tom Williams, GiveMeaning: Tom told the story of how he used to be making big bucks in high finance, and thought he was happy until someone he had known before asked him a penetrating question. I don’t remember the question, but it was something along the lines of “Are you really happy?” or “Does your life have meaning?” and that made him realize he wasn’t happy. Tom quit his job and went looking for his purpose and couldn’t find it. He came back to Vancouver, found that guy, and said something along the lines of “You ruined my life with your question, how do I fix it?” The guy said, “Follow your passion.” Tom said, “How do I find my passion??? ?” The guys said, “Follow your tears.” From that, Tom started a micro-charity site. (Think microlending, but microgiving instead.) People can create projects (e.g. “sponsor me for the Breast Cancer Walk”) that others can then donate small amounts to. Naomi Devine, uvic.commonenergy.org: I don’t have a strong memory of this talk. I think she was arguing for getting involved in local politics, especially green politics. I suspect that the talk didn’t register because it either trying to persuade me of something I already believe, or teaching me how to do something I already know. James Glave, glave.com: I have very weak memories of this talk also. I think again, he was trying to persuade me on something I’m already persuaded on. Colin Keddie, Buckeye Bullet: Colin gave kind of a hit-and-run talk about the Buckeye Bullet, a very very fast experimental car developed at Ohio State University and which runs on fuel cells. I would have liked to have heard more about how the car worked, the challenges that they faced, etc. However, he only had three minutes, and that’s not a lot of time. Joe Solomon, engagejoe.com: I don’t have any memories of this talk. Maybe I was getting tired then? Maybe I’m getting tired now? Dave Ng, biotech.ubc.ca: Dave’s talk was on umm science illiteracy. Dave gave a very engaging talk. He put up three questions, and had us talk to our neighbours to help us decide if they were true or false. All of them seemed to be designed to be so ridiculous that they couldn’t possibly be true. I happened to have read Science News for enough years, that I was very confident that the first two were true (which they were). The third was something about how 46% of Americans believe they are experts in the evolutionary history of a particular type of bird — again it looked like it couldn’t possibly be true. It was a bit of a fakeout: it turned out that 46% of Americans thought that the Genesis story was literally true. The audience participation was fun. David Young, 2ndglobe.com: David talked about Great Place/times and wondered why Vancouver couldn’t do that. He pointed out that Athens in Socrates’ time, Florence in Michelangelo’s time, Vienna in Beethoven’s time, the Revolutionary War-era US, and several other place/times had far fewer residents than Vancouver, so why can’t we do the same? Great wealth (which means lots of leisure time). Frequently this wealth came by exploiting some other people. The US Founding Fathers and Athenians had slaves, for example. Lack of entertainment options. We are less likely to do great things if The Simpsons is on. I also had an interesting time talking with Ray-last-name-unknown, who I met at some event a few months ago and who I’d spoken to at length at Third Tuesday just a few nights before. We walked back to downtown together and didn’t have any dead spots in the conversation. I really wanted to like Expertise in Debugging Computer Programs: a Process Analysis by Iris Vessey (Systems, Man and Cybernetics, IEEE Transactions on, Vol. 16, No. 5. (1986), pp. 621-637.) Van Mayrhauser and Vans said in Program Comprehension During Software Maintenance and Evolution indicated that Vessey had shown that experts use a breadth-first approach more than novices. I was a little puzzled, though, because Schenk et al, in Differences between novice and expert systems analysts: what do we know and what do we do? cited the exact same paper, but said that novices use a breadth-first approach more than experts! Clearly, they both couldn’t be right, but I was putting my money on Schenk just being wrong. It also looked like the Vessey paper was going to be a good paper just in general, that it would tell me lots of good things about programmer productivity. Well, it turns out that the Vessey paper is flawed. She studied sixteen programmers, and asked them debug a relatively simple program in the common language of the time — COBOL. (The paper was written in 1985.) It is not at all clear how they interacted with the code; I have a hunch that they were handed printouts of the code. It also isn’t completely clear what the task termination looked like, but the paper says at one point “when told they were not correct”, so it sounds like they said to Vessey “Okay, the problem is here” and Vessey either stopped the study or told them “no, keep trying”. She didn’t normalize by how long they spent to finish the task, she just looked at the count of how many times they did X. 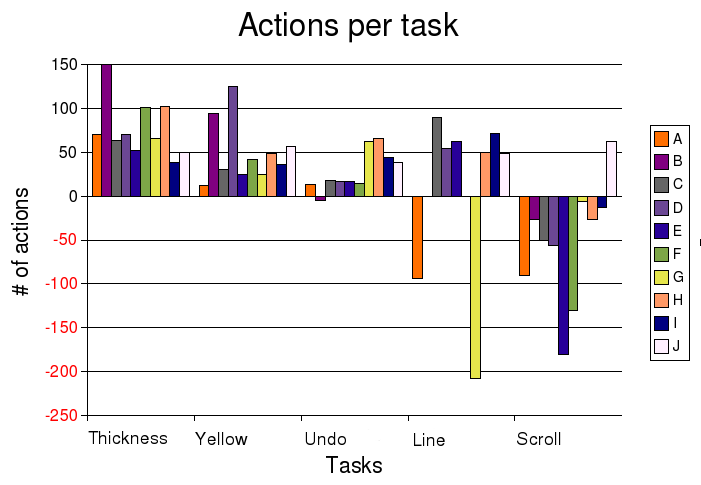 There were three different measures for X: how often did the subject switch what high-level debugging task they were doing (e.g. “formulate hypothesis” or “amend error”); start over; change where in the program they were looking. She then noted that the experts finished much faster than the novices. Um. She didn’t seem to notice that the that the count of the number of times that you do X during the course of a task is going to correlate strongly with how much time you spend on the task. So basically, I think she found that people who finish faster, finish faster. She also noted that the expert/novice classification was a perfect predictor of whether the subjects made any errors or not. Um, the time they took to finish was strongly correlated with whether they made any errors or not. If the made an error, they had to try again. Vessey said that 15/16 experts could be classified by a combination of two factors: whether they used a breadth-first search (BFS) for a solution or a depth-first search (DFS) whether they used systems thinking or not However, you don’t need both of the tests; just the systems-thinking test accurately predicts 15/16. All eight of the experts always used BFS and systems-thinking, but half of the novices also used BFS, while only one of the novices used systems-thinking. Unfortunately, Vessey didn’t do a particularly good job of explaining what she meant by “system thinking” or how she measured it. Vessey says that higher chunking ability will manifest itself in smoother debugging, which she then says will be shown by the “count of X” measures as described above, but doesn’t justify that assertion. She frequently conflates “chunking ability” with the count of X, as if she had fully proven it. I don’t think she did, so her conclusions about chunking ability are off-base. One thing that the paper notes is that in general, the novices tended to be more rigid and inflexible about their hypotheses. If they came up with a hypothesis, they stuck with it for too long. (There were also two novices who didn’t generate hypotheses, and basically just kept trying things somewhat at random.) This is consistent with what I’ve seen in other papers. I got started on looking at productivity variations again and just couldn’t stop. I found Programmer performance and the effects of the workplace by DeMarco and Lister (yes, the authors of Peopleware). The paper is well worth a read. In their study, they had 83 pairs of professional programmers work all on the same well-specified programming problem using their normal language tools in their normal office environment. Each pair was two people from the same company, but they were not supposed to work together. The average time-to-complete was about twice the fastest time-to-complete. Over and over, I keep seeing that the median time to complete a single task is on the order of 2x to 4x times the fastest, not 100x. This study seems to imply that a great deal of that difference is due not to the individual’s inherent capabilities, but rather the environment where they work. To reiterate, there’s a paper by Sackman et al from 1966 that people have seized upon to show a huge variation in programmer productivity, a paper by Dickey in 1981 that refuted Sackman pretty convincingly, and an article by Curtis in the same issue as Dickey’s. I didn’t talk much about the Dickey paper, but Tony Bowden has a good blog posting on the Dickey paper, where Dickey reports on a more reasonable interpretation of numbers from the Sackman’s data. 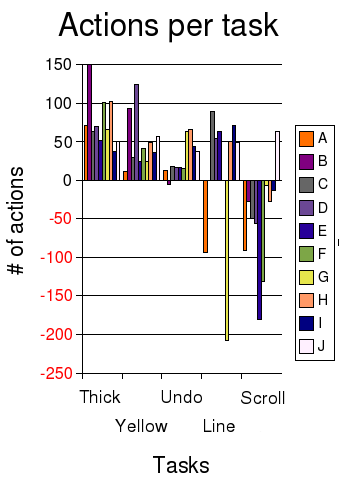 Because I like making pretty histograms, here are the Sackman numbers via Dickey via Bowden — the way they ought to be interpreted. These show the time to complete for two tasks, the “Algebra” task and the “Maze” task. The small sample size hurts, but (as in the Curtis data and the Ko data) I don’t see an order of magnitude difference in completion speed.